KREATIVEassassin: Part 2: Now You're Playing With Power! Part 2: Now You're Playing With Power! Today we're going to talk about my beginnings with the Nintendo Entertainment System. Details are a little more concrete this time around as I actually remember more about the time period. This one is a little lengthy, so go make yourself a sandwich or something and then dive into Part 2: Now You're Playing With Power! In January of 1987, I attended the birthday party of one of my classmates. It was at this party that I saw the Nintendo Entertainment System for the first time ever. 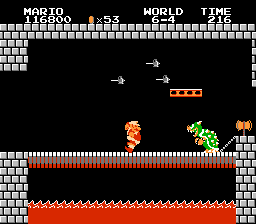 I had never seen anything like it before, and I was completely blown away by Super Mario Bros. I remember sitting on the end of his bed playing it and being in complete awe of what I was seeing on the screen. I knew I had to have one, and when my mom came to pick me up, I made sure to show her this incredible piece of gaming technology. That night, I went home and played my sad little Atari 2600. It didnt even compare. Almost a month to the day later, I received an NES for my birthday (which I kept calling the "Intendo" until my dad corrected me). I only had the pack-in double pack Super Mario Bros./Duck Hunt to play, but that was enough for a while. Even my mom and dad played the NES occasionally. My dad could make it to the third world, but my mom was never able to get past the water level. This is the only memory I have of my mom ever playing video games. My dad, on the other hand, used to be very good at the Game Boy Tetris. The next games I acquired were Castlevania 2: Simon's Quest and Zelda 2: The Adventure of Link. I remember being at K*B Toys with my mom and buying Zelda 2: The Adventure of Link, and she told me that it looked too hard and that I should buy Solomon's Key instead. I don't know why of all games she picked that one out, but I'm glad I didn't listen and got Zelda 2 regardless. She was right about one thing, though: Zelda 2 was pretty difficult! In 1988 I had chicken pox. I remember laying underneath a coffee table at my grandparents' (not the ones who gave me the Atari) house and feeling absolutely miserable. I was sick for a while, and my mom rented Super Mario Bros. 2 from a video store called B.J. 's Video while I was out of school. Eventually it had to go back to the store, but I ended up borrowing it from someone my dad worked with and finishing it. Soon afterwards, I borrowed Metroid, and then eventually Hogan's Alley from the same person. I remember I woke up one day and the Metroid cart was sitting in the living room. The game was huge and I had no idea what was going on or where I was going, but it was an experience I'll never forget. The sheer scope of the game was mind blowing. Because I didn't know then what I know now, when my NES unit began to start acting up, I felt that it was broken and that I needed another one. The flashing power light which we have all experienced at some point was starting to occur. My parents bought me another NES console, the same kind as before with Super Mario Bros. and Duck Hunt, only there were two differences this time: One, the zapper was a neon orange color instead of gray. This confused me, and I didn't really know or understand why at the time this change occurred. The second difference was more subtle. I noticed on my Super Mario/Duck Hunt cartridge that there was a white line separating the Super Mario Bros. and Duck Hunt pictures, and that the new one had the oval seal of quality. The difference intrigued me, and it was the first time I ever noticed or saw a label variation. 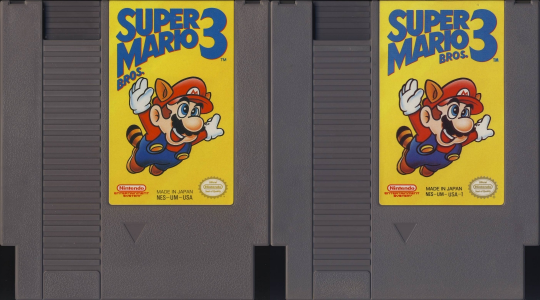 And speaking of label variations, the second variant I ever saw was for Super Mario Bros. 3. My good friend Eric who lived a few houses down from me had a copy of the game, and the back of the box showed screens that were not in the game. We also noticed that the position of the word Bros. on the front was different. Note the placement of the word Bros. Left is the original, right is the -1 revision. The NES brought with it a sense of wonder that I had never experienced with my Atari 2600. Games were the topic of many discussions among friends, family, and even teachers. My 3rd grade teacher and I talked about The Legend of Zelda on numerous occasions, even going so far as to draw and exchange maps. My parents, well, my dad at least, would talk to me about making and breaking high-scores in Super Mario Bros. and Duck Hunt. With the discussions, though, also came lies and embellishments. I went to school with a guy named Paul who, for whatever reason, told us lie after lie about our favorite games. A few examples of fake tips and secrets from Paul include conquering Mega Man 2 will reveal Link jumping from the globe on the ceiling and down stabbing Dr. Wily. In Zelda 2: The Adventure of Link, he instructed all of us to "use thunder on the river demon," when you are actually supposed to use the flute. It also wasn't just Paul who would say things like this. My friend Brett said that he owned a blue zapper, but I never got to see it because it was always "locked in a drawer." He also claimed that once you beat Super Mario Bros. 2 and waited for a while after the credits, the game would begin showing screenshots from the then unreleased third game. I don't know if kids do this sort of thing today or not, but back then it was quite common. Many years after the NES' heyday, I started buying NES games from a tiny grocery store near my grandparents' called Horn's Market. For a while I was just renting the games, but eventually I started buying them for $10 each. 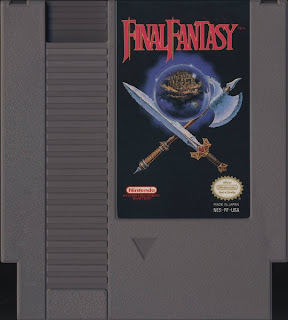 At the time that seemed like a fair price, and later it seemed like way too much to pay for an NES game. Today, though, $10 for boxed NES games would be a pretty good deal. As time passed, I started getting a pretty decent collection of NES games. At some time around here is when my friend Brett and me stumbled upon a website that dealt in used video games. The website was called, fittingly enough, UsedVideoGames.com. We were at my grandparents' house one night and he was looking around on the internet and found the site. Their prices were half of what we were paying at Horn's Market, so we were already amped up about the idea of getting twice as many games for the same price we were used to. Games we had always wanted were all listed on the site for $5 each. Brett took the plunge and was the first one to place an order, and what he received was a little less than stellar. The games weren't all in the best condition, and that troubled me. I knew that I had to have some of these games (like River City Ransom for $5? Sign me up!) so I made out a template that I could print out that would list all the games I wanted along with the special note that I was very concerned about what the games look like and to please select the best one before sending it. For the most part, they seemed to listen, but my copies of Jackie Chan's Action Kung Fu and Double Dragon were pretty rough. The Double Dragon looked like it had an asterisk carved into the label. Around 1997 a buddy of mine named Chris worked in a video store called Silver Screens Video. My friends and I used to go there and hang out, and many times other friends would make their way into the store. You never knew who you were going to see there on a given night. One day a friend of ours named Joey came in and told us about a pawn shop the next town over called Midwest Cash that had tons of NES games for dirt cheap. Joey told us where the store was, and we immediately set out to investigate. One of my original $3.49 purchases. I remember walking in and seeing a huge rack in the back of the store that was full of NES games. My friends and I browsed through the titles and picked out several staple games that anyone starting off needed to have. The prices there were ridiculously cheap. We were grabbing NES games for $3.49 each, which was even cheaper than the "cheap" games we were buying online. Going to this place became an almost weekly tradition for me, one which I continue to do to this day. When I started collecting NES games, my first goal was to collect all the "black box" games. Some examples of black box games are Super Mario Bros., Kung Fu, Hogan's Alley, Excitebike, etc. To this day I'm still missing Stack Up and Donkey Kong Jr., so I still haven't even reached my original goal. My second goal was to own every game in the Official Nintendo Player's Guide, but anyone that has flipped through its pages knows that it has Stadium Events in it, which I'm not fool enough to believe I'll ever find in the wild and not rich enough to ever pay what it's worth. Once I started getting more and more games, my third goal was just that I wanted every licensed NES game released in America. As of writing this, I only need 63 NES games before I have them all. Not bad for never resorting to eBay. Today, it is very rare for me to find an NES game I don't own. Since it's so uncommon for me to find games I need, I have recently turned to buying screw and seal of quality variants. Below are three different versions of Hogan's Alley that I own. Five screw, three screw with round seal, and three screw with oval seal versions of Hogan's Alley. If my past self knew that 26 years later I would own 740 NES games, I never would have believed it. It would have sounded like such an impossible feat! But I do believe that I wouldn't be surprised to learn I was still gaming, though. I think I would completely understand why I would still be doing it.